Yaniv - thanoscardgamess jimdo page! This is an unusual draw and discard game that has become popular with the younger generation in Israel in the last few years, both at home and when travelling abroad. It is somewhat akin to Rummy, in that players can get rid of cards by forming them into sets and sequences, but the mechanism of play is somewhat different. 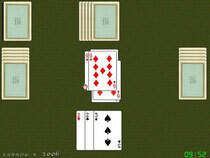 Sets and runs are not melded but discarded, so that one of the cards used can be picked up by the next player. Each game is composed of rounds, with score being kept between them, and the goal of the game is to keep your score to a minimum. Players with more then 200 points drop out of the game, which is then continued until there is only one player left.